Mangaluru, June 1, 2017: Dakshina Kannada District administration has extended prohibitory orders under Section 144 of CrPc from till June 9 midnight in Bantwal Taluk.In wake of stabbing of a youth from minority community allegedly by saffron activists last Friday, district administration had clamped prohibitory orders in Bantwal. With situation still tense, the order has been extended. Renuka Prasad, Assistant Commissioner said that prohibitory orders are imposed across Bantwal Taluk. 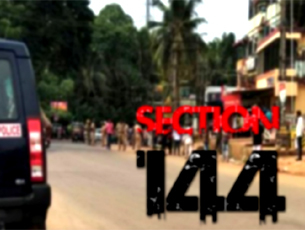 He said Section 144 of CrPC prohibits any assembly of five or more people in an area where the section has been imposed. Every member of such unlawful assembly can be booked for engaging in rioting, maximum punishment for which is three years.